In southern Bavaria, not far from Reutte, on a rugged mountainside surrounded by a breath taking scenery, you can find the magnificent Neuschwanstein Castle – one of the most popular sights in Germany. This building, which was constructed in the style of a medieval castle, fascinates the whole world with its romantic architecture and pompous interior. Each and every year millions of tourists come to Neuschwanstein to see the so-called „fairy-tale castle“ of Ludwig II, the former Bavarian king. Built in 1869, the castle is proof for the King Ludwig's love of fine arts, and his admiration for Richard Wagner. The pictorial depictions of the worlds of legend and myth that Wagner too, often used in his works, have a ubiquitous presence. Two rooms especially attract the eye. The magnificent Singers' Hall had been recreated in the image of the Singers' and Celebration Hall in the Wartburg, and decorated with large murals and images of the „Parzifal“ legend. The 15meter high throne room, reminiscent of the Allerheiligen-Hofkirche in the Munich residence, mesmerises with its rich golden interior. Many rooms of the castle are nowadays some of the most important ones in German historicism. The grotto with its small waterfalls and the colourful lighting, that looks like a stalactite cave, is also one of the most elaborate sights the castle has to offer. 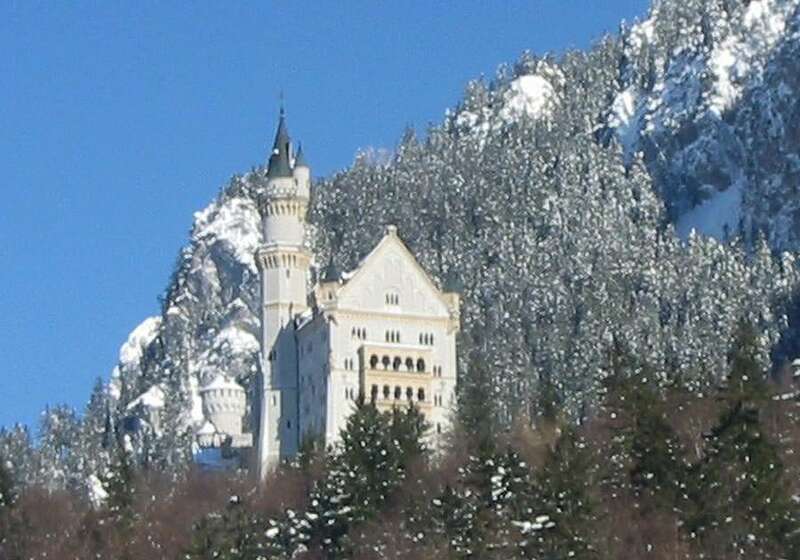 Neuschwanstein offers a truly dreamlike view – On the outside as well as on the inside. Small wonder, that the castle made it into the final selection at the poll for the new wonders of the world in 2007. The castle is opened for visitors throughout the year. Tickets for a guided tour can be bought online or on-site.